Several days ago I met with a group of young adults and we ended up discussing Chinese politics. They complained about many nuisances- from high housing prices, low wages, corruption and government officials' fervency on emigration- and blamed the Party’s monopoly on power as the root cause of each of these ills. I told them that in addition to the Communist Party, China actually has eight other political parties. They stared at me as if I was telling a joke. Although not known to most people, China indeed has nine legitimate parties, the Communist Party and eight non-Communist parties. They are not necessarily like the Republican Party in the United States, but nevertheless are non-Communist parties in Chinese politics. These parties supported the Communist Party in their war against the Kuomintang in the late 1940s. Many people may be curious about what role these parties play in today's politics in China. The answer is actually quite simple: they help the Communist Party hold power. To use a historical example: imagine modern China as an ancient empire, not dissimilar from its past. The only difference is that the emperor of this empire is not hereditary, but nominated by the “elders.” China has nine “elders”, they are the members of the Standing Committee of the Political Bureau of the Communist Party. The general secretary is the “emperor,” the leader of the “elders” and indeed the leader of the entire empire. In addition to the emperor and the elders, there are also ministers. Most ministers, of course, are loyal to the emperor and the elders- they are officials of the Communist Party at all levels. However, to maintain its rule, an empire must also show generosity and humility, listen to different voices, and accept advice and suggestions from different aspects of society. These 'aspects' are the non-Communist parties. After Mao Zedong led the Communist Party to establish the People's Republic, the status of these parties became increasingly weakened. When the People's Republic was just founded, 1 or 2 of the non-Communist parties could serve in chief positions with real power. 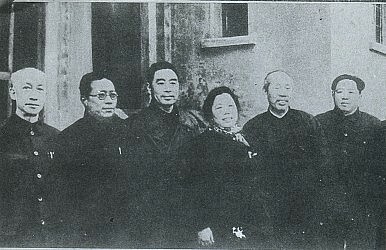 For example, Shen Junru, the first President of the Supreme Court was the Chairman of the China Democratic League, one of the eight non-Communist parties. During the Cultural Revolution, however, these parties existed in name only. It was only after Deng Xiaoping came to power, and sought to restore the Communist Party’s tradition of accepting remonstrance, that the non-Communalist parties began to be taken seriously again. For instance, the leaders of the eight non-Communalist parties joined the National People's Congress and the CPPCC (Chinese Parliament), albeit their members only held honorary positions, not the real power that the first President of the Supreme Court held. Even so, the Communist Party has continued to show them great respect, as evidenced by their willingness to always discuss significant matters and consult with them. Although the non-Communist parties are merely "ornament" in the eyes of many people, a lot of people still desperately want to join their ranks. In fact, a friend of mine recently asked if I was acquainted with any members of these groups as he wanted to join them. He explained to me that to achieve a promotion in the company he works for, in addition to Communist Party members, non-Communist party members will be given priority in consideration because the official regulations specify a certain proportion of non-Communist party members hold leadership positions, which means that if he becomes a member of a non-Communist party, he is more likely to stand out in the competition because the other competitors are all members of the Communist Party. He said it is an open secret that many people join the non-Communist parties in order to recieve promotions from their employers. When I asked him what the aim and purpose of the non-Communist parties he looked puzzled. “To make more money,” he finally answered. However, it is not easy to join these groups. Many parties require their members to have certain academic qualifications and titles. For example, some require that prospective members have a master's degree, intermediate professional titles (equivalent to associate professor), or outstanding contributions and awards in their respective fields. Many netizens have expressed dissatisfaction with these parities, however, particularly the lack of official data on their internal budgets and expense sheets. Someone remarked on Weibo recently that, while it may be taken for granted that the taxpayers support the Communist Party, why must they also support the other eight parties? It's certainly an interesting question.